Stand with Quebec Crane Operators and Construction Workers Fighting for Their Rights and the Rights of All! The Quebec Construction Commission (QCC) has declared that crane operators in Quebec are engaged in an illegal strike. This claim was made on June 18 after workers did not report for work on construction sites throughout the province. The representative of the QCC blustered in front of the media that it is gathering as much information as possible to prove crane operators are engaged in an illegal strike and that criminal charges are soon coming. Unions or union representatives found guilty of ordering, encouraging, supporting or participating in a strike ruled illegal are liable to a fine of $7,960 to $79,587 for each day or part of a day. The workers themselves are liable to fines of up to $199 a day. The representative of the QCC also levelled the, now customary, charge that intimidation is being used to incite workers to strike and that criminal proceedings for intimidation will also be filed. Charges of intimidation can lead to workers being disqualified from leading or representing a trade union for five years. This follows a campaign by the QCC over the last few weeks, travelling to building sites across Quebec to spy on workers and warn them they will be prosecuted if they defend their rights in a concerted fashion, such as refusing to work overtime or engaging in any activities that hinder, slow down or interrupt work. The facts of the situation are the following. Crane operators working on the construction of the new Champlain Bridge left the job site on Thursday, June 14. Rain had forced the stoppage of work but the general contractor violated the collective agreement requiring crane operators to be paid a minimum of 5 hours when operations are halted due to inclement weather. The crane operators did not return to work on the Champlain Bridge the following day and did not show up Saturday for overtime work. On Monday, June 18, crane operators across Quebec did not show up for work causing those sites that require crane operations to be idled. 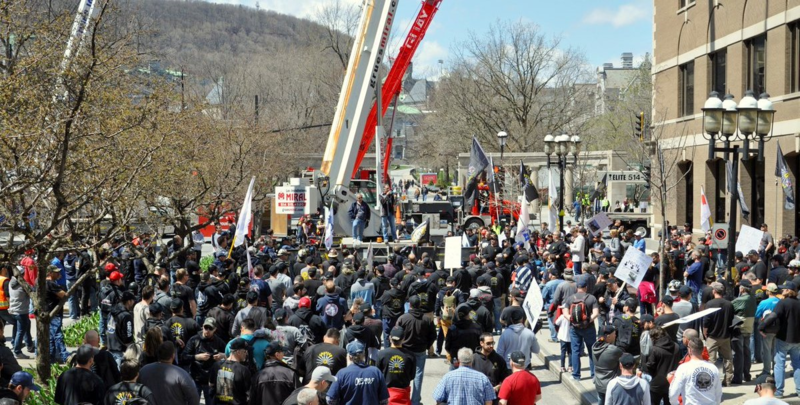 The crane operators have been engaged in vigorous opposition to a new regulation put forward by the QCC and endorsed by the Quebec government, which threatens to put the lives and safety of crane operators, other construction workers, and the public in danger. The new regulation would drastically reduce the quality and quantity of training received by crane operators. The government, at the bidding of the QCC, has abolished the requirement that a crane operator complete the Diploma of Vocational Studies (DVS), which includes 870 hours of training. The DVS is now optional and a new training regime has been introduced made up of a mere 150 hours provided directly on worksites under company direction. The QCC and government have also concocted an 80-hour course to operate boom trucks with a maximum capacity of 30 tonnes, after which a worker who passes the course becomes a qualified operator for that type of crane. This type of crane has a history of overturning the most and causing the most damage. This is the current confrontational context in which the actions of the crane operators are taking place. The QCC and government dismiss the efforts of construction workers to defend their right to adequate training. They have refused to listen to the representations of workers to demand that the new regulations not be passed and a task force be created with all concerned parties to study the situation. The QCC has become an oppressive police agency of the state to criminalize workers who defend their rights and to stifle the voices of all concerned with the deteriorating standards and attacks on rights and safety in the construction sector. In the face of the situation, the Labour Standards, Pay Equity, and Workplace Health and Safety Board (CNESST in French) is shamefully silent about this deliberate lowering of health and safety standards. The Quebec government, which passed Bill 152 to further criminalize construction workers, has rubber stamped the new regulations. The institutions that claim to be the public authority and to represent the public interest refuse to defend it. They have slammed their doors shut to the workers, the very people who know from experience the dangers that exist and the increased danger to everyone with this lowering of training standards and attacks on rights. What are construction workers supposed to do when all avenues of discussion within the old institutions are blocked? The problem construction workers face in this reality is a problem that all workers and society must face with urgency and determination. The new regulation and Bill 152 are nothing but neo-liberal instruments to lower working conditions in construction and attack the struggle of workers organized in trade unions. The aim is clearly to increase the profits of construction companies to the detriment of workers and the public. Lowering the training standards for workers to qualify as crane operators and putting the companies in charge of worksite training increases competition among workers for available work and puts them at greater risk of injury and death. They will be under even more pressure from employers to perform dangerous and even illegal tasks under the threat of not being called to work on the next job. Everyone knows that the big companies responsible for the training of crane operators will increase pressure on them to work under the table, a practice already rampant in construction. According to construction workers, up until the new regulation, only the crane operators have been able to keep illegal activities of the companies in check. The required vocational training has played a role in this because it made the workers more knowledgeable, and imbued within their consciousness the confidence to identify and refuse unsafe work and to declare openly and legally their hours of work with the full organized support of the union. The new measure is a deregulation of the crane operators' trade, a part of the deregulation of construction trades in general and lowering of working conditions. The sole purpose is to serve those who own and control the big construction companies and their expropriation of the value workers create. The campaign and attacks of the QCC on crane operators are socially irresponsible actions that violate their rights and put the public in danger. Cranes are often used in heavily populated areas. The backward march of the QCC and government deserve condemnation in the strongest terms by all working people.